Our retail ready essiac is widely popular among health practitioners and health food stores alike. While some individual essiac users prefer to purchase bulk essiac or unlabeled packets to save money, more sophisticated packaging is necessary in the retail setting. If you're interested in reselling essiac or you wish to give essiac as gifts, you may prefer the thermal-sealed and labeled product. Naturally, our sealed and labeled retail ready essiac costs more per pound, but in the spirit of our website we've still kept the price far below market value for essiac. Each packet prepares 1 quart of tea, which lasts 10-11 days for one person at standard recommended maintenance dose. The 1 lb. order will prepare sixteen quarts of tea, or enough to last one person 170 days at standard recommended maintenance dose. Click here to order 1 lb. sealed and labeled essiac in sixteen (16) 1-oz. packets for $46.37 (save $10.00). 4-oz. sealed and labeled packets: Each packet prepares 1 gallon of tea, which lasts one person two weeks at standard recommended aggressive dose. The 1 lb. order will prepare four gallons of tea, or enough to last one person eight weeks at standard recommended aggressive dose. Click here to order 1 lb. of factory-sealed and labeled essiac in four (4) 4-oz. packets for $33.84. The 3 lb. 4 oz. order will prepare thirteen gallons of tea, or enough to last one person six months at standard recommended aggressive dose. Click here to order 3 lb. 4 oz. of sealed and labeled essiac in thirteen (13) 4-oz. packets for $115.47 (save $10.00). The 6 lb. 8 oz. order will prepare twenty-six gallons of tea, or enough to last one person one year at standard recommended aggressive dose. Click here to order 6 lb. 8 oz. of sealed and labeled essiac in twenty-six (26) 4-oz. packets for $220.94 (save $30.00). 1-lb. 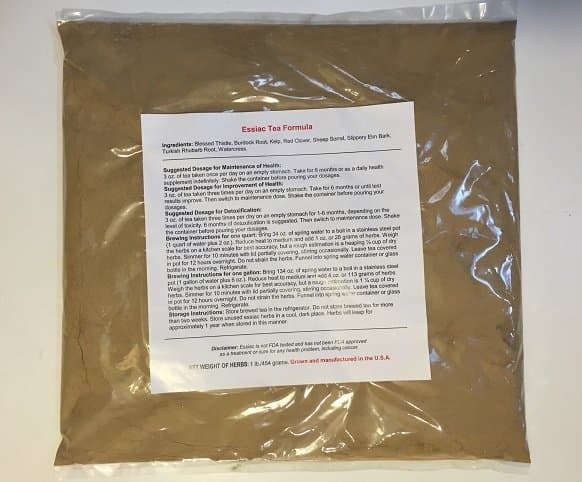 sealed and labeled bags: Each bag prepares four gallons of tea, which lasts one person eight weeks at standard recommended aggressive dose or twenty-four weeks at standard recommended maintenance dose. The 1 lb. order will prepare four gallons of tea, which lasts one person eight weeks at standard recommended aggressive dose or twenty-four weeks at standard recommended maintenance dose. Click here to order 1 lb. of factory-sealed and labeled essiac in one (1) 1-lb. bag for $24.97. The 4 lb. 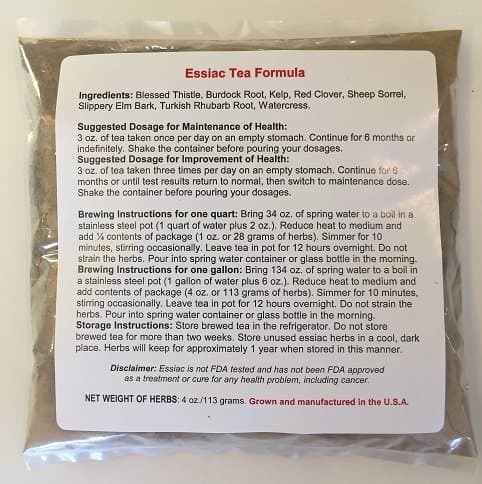 order will prepare four gallons of tea, which lasts one person thirty-two weeks at standard recommended aggressive dose or seventy-two weeks at standard recommended maintenance dose. We offer a discount on the sealed and labeled 1-lb. bags when you purchase a larger quantity: Click here to order 4 lbs. of factory-sealed and labeled essiac in four (4) 1-lb. bags for $89.87. The 10 lb. order will prepare forty gallons of tea, which lasts three people six months at standard recommended aggressive dose or nine people six months at standard recommended maintenance dose. Click here to order 10 lbs. of factory-sealed and labeled essiac in ten (10) 1-lb. bags for $219.70 (save $30.00). Thanks for taking a look at our retail ready essiac selection. If you have questions about our retail ready essiac please Contact us.